Last Sunday 9th of November some very talented young and slightly older artists gathered to paint the bollards at Avalon Beach SLSC. As you can see from these wonderful photographs some great new designs have brightened up the park area adjacent to the beach. Years ago residents painted the bollards installed outside Avalon Beach Surf Life Saving Club. Led by landscape architect Richard Stutchbury, people coloured and carved the bollards with beach focused designs. Over the years the elements caused these designs to fade and the bollards needed a repaint. 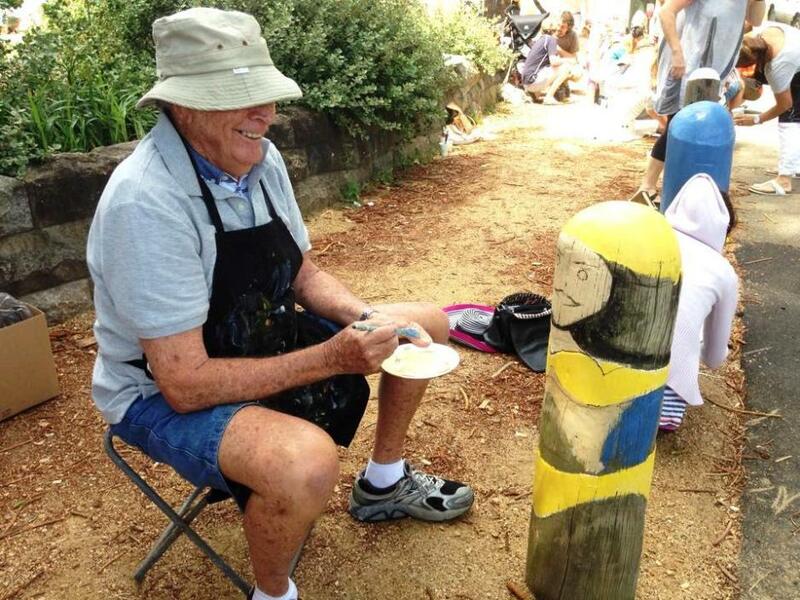 To celebrate the opening of its newly refurbished building, Avalon Beach SLSC and Pittwater Council invited artists to come along and paint new designs on the bollards. 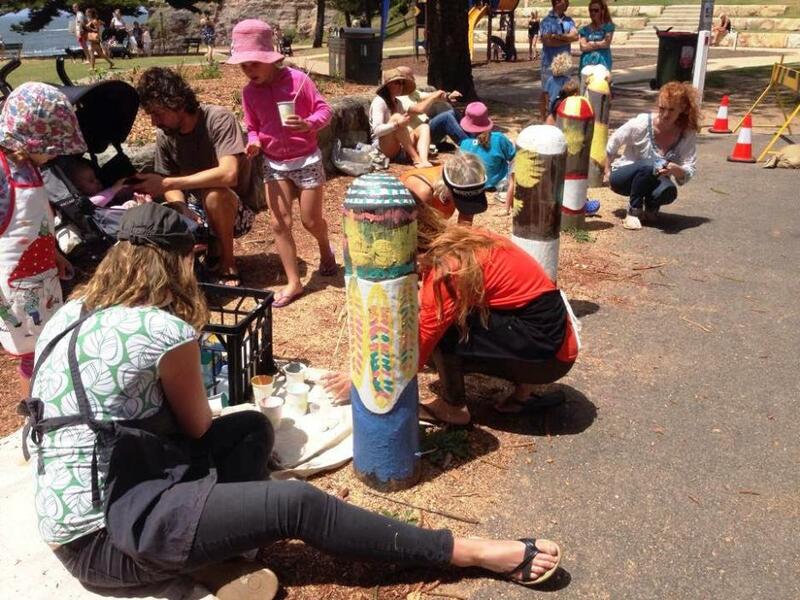 Paints and brushes were provided and with 18 bollards there was plenty of great works created. Richard Stutchbury instigator of the painting of the bollards - the back of his shirt. Originally a bollard meant a post used on a ship or a quay, principally for mooring. The word now also describes a variety of structures to control or direct road traffic, such as posts arranged in a line to obstruct the passage of motor vehicles. In mountaineering it means an outcrop of rock or pillar of ice that may be used to belay a rope! The term is probably related to bole, meaning a tree trunk. The earliest citation given by the Oxford English Dictionary dates from 1844: previously. The Norman-French name Boulard (still often found in Normandy) may be related. From the 17th and 18th centuries, old cannon were often used as bollards on quaysides to help moor ships alongside. The cannons would be buried in the ground muzzle-first to approximately half or two-thirds of their length, leaving the breech (rear) projecting above the ground for the attachment of ropes. Later (19th-century) bollards were often given the same cannon shape. Wooden posts were used for traffic management since the beginning of the 18th century. One of the earliest documented cases is that of the "two oak-posts" set up next to the medieval Eleanor cross at Waltham Cross, Hertfordshire, in 1721, at the expense of the Society of Antiquaries of London, "to secure Waltham Cross from injury by Carriages". Similar posts can be seen in many historic paintings and engravings. Right: The Arch of Septimius Severus in Rome, painted by Canaletto in 1742. Five bollards stand beyond the arch, apparently placed to protect it from vehicle damage. There area few types of bollards for various uses; Maritime bollards, Traffic bollards, Illuminated bollards, Bell bollards (designed to deflect vehicles' tires – here we call them ‘silent policemen’), removable bollards and Protective bollards. In the maritime definitions in which the term originates, a bollard is either a wooden or iron post found as a deck-fitting on a ship or boat, and used to secure ropes for towing, mooring and other purposes; or its counterpart on land, a short wooden, iron or stone post on a quayside to which craft can be moored. The Sailor's Word-Book of 1867 defines a bollard in a more specific context as "a thick piece of wood on the head of a whale-boat, round which the harpooner gives the line a turn, in order to veer it steadily, and check the animal's velocity". Mooring bollards are seldom exactly cylindrical, but typically have a larger diameter near the top to discourage mooring warps (docklines) from coming loose. Single bollards sometimes include a cross rod to allow the mooring lines to be bent into a figure eight. Protective bollards are used throughout heavy industry and in commercial building management to protect assets. They usually consist of a simple steel post either anchored to concrete, cored into a hard surface, buried in the ground or secured on a Self-locking Taper or Impact Recovery System protecting the surrounding foundations from damage when a bollard is impacted. These bollards protect utilities, electronics, machinery, buildings, or pedestrians from accidental collisions by vehicles. There are more than 100 of these huge painted icons guiding visitors along the foreshore walking/cycling track from Rippleside Park, through Waterfront Geelong to Limeburners Point and the Botanic Gardens. They represent a fascinating and fun chronicle of the city's past, focusing on some of the unique characters who played a part. It is an anecdotal history, tracing Geelong 's development from the original Koori inhabitants to more contemporary characters. You'll find young ladies in neck-to-knee costumes, lifesavers, families, a footballer, sailors, a town band, fishermen and dozens more. The colourful bollards are the work of artist Jan Mitchell. Jan was commissioned by the City of Greater Geelong to transform old timbers and piles from a city pier, demolished in the 1980s, into remarkable works of art that stop young and old in their tracks. Also among the 104 sculptures are a Koori family, English explorer Matthew Flinders and a Portuguese explorer which stand overlooking Corio Bay near Limeburners Point. At Eastern Beach, you can see bathing beauties from the 1930s and Ian McDonald, the city surveyor who drew the plans for the landmark sea baths. Pictures by and courtesy Christine Hopton – President Avalon Beach SLSC, 2014.